Gigabyte has added three new AMD Epyc server systems to its B2B product roster. Two of the systems are single socket 2U GPU servers and one is a 4U storage server. Gigabyte designed the new business and enterprise targeted products as it believes that AMD Epyc processors deliver "a whole new value proposition to the x86 world," while boasting flexibility, and high spec memory, I/O and network connectivity. Whichever of the new servers you choose, you will benefit from EPYC's impressive compute and I/O resources of 32 cores, 64 threads, over 2TB of memory capacity, and 128 PCIe lanes per socket. 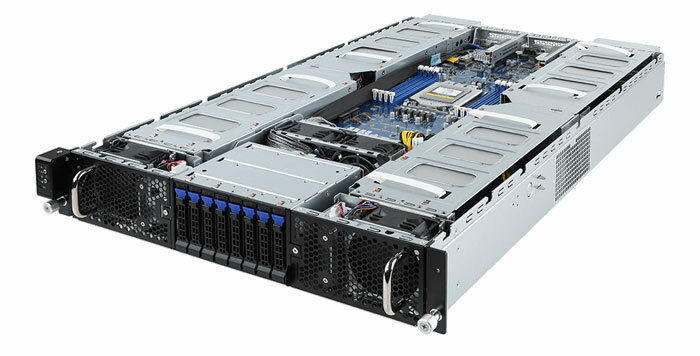 This is a high density HPC server that supports up to eight PCIe Gen3 double slot GPU cards. That includes support for Radeon Instinct MI25 cards, if you were in any doubt. Other key features are its single AMD Epyc 7000 processor, 8x DIMM slots, 8x 2.5-inch hot swappable drive bays, plus 2x M.2 with PCIe Gen3 x4/x2 interface, 2x PCIe x16 half-length low-profile slots for add-on cards, 2x SFP+ 10Gb/s LAN ports, local and remote management, and dual 2200W 80 PLUS Platinum redundant/hot-swap power supplies. With the above specs, Gigabyte suggests that the G291-Z20 is best suited for HPC applications such as real time analytics, programs in scientific simulation and modelling, engineering, visualization & rendering, data mining and more. If you are interested in the above you can go over to the dedicated product page and check out further details, diagrams, and photos. If you don't need quite so much GPU acceleration on tap, then the Gigabyte G221-Z30 might appeal. It still uses a single AMD Epyc 7000 processor but re-jigs the product mix in favour of greater storage. The key features of this server are its; support for up to 2x double slot GPU cards, 16x DIMM slots, 16x 2.5-inch hot swappable drive bays, plus 1x M.2 with PCIe Gen3 x4 interface, 2 x SFP+ 10Gb/s LAN ports, local and remote management, and dual 1200W 80 PLUS Platinum redundant power supplies. Buyers of the G221-Z30 server are likely to find it appealing as a multi-purpose, flexible and cost efficient HPC solution for research and development. Here is an appealingly flexible option for storage server buyers. 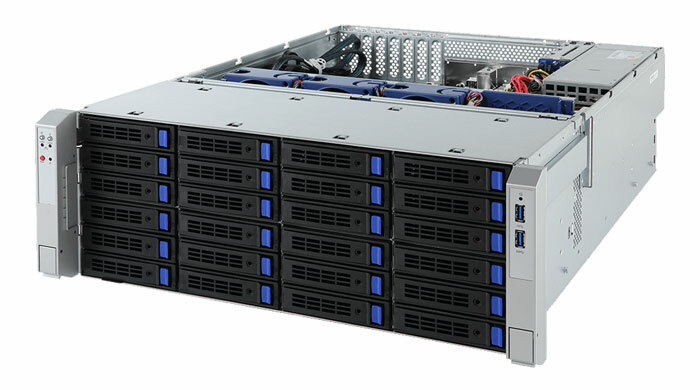 With its capacity for up to 36x 3.5-inch SATA/SAS hot swap drives (24 in the front and 12 in the rear) it provides up to 500TB of storage capacity to allow for an excellent scale-out. There are also 2x 2x 2.5-inch hot-swappable HDD / SSD bays in the rear for OS boot disks allowing the S451-Z30 to be utilised as a stand-alone storage device. Lastly, on the storage front, there is a PCIe3 x4 M.2 slot onboard. Other key features of the S451-Z30 are its 16x DIMM slots, 2x SFP+ 10Gb/s LAN ports, Up to 4x PCIe Gen3 x16 slots and 3x PCIe Gen3 x8 slots, local and remote management, and dual 1200W 80 PLUS Platinum redundant power supplies. In an email to HEXUS, Gigabyte explained that "an SAS expansion card has not been included as standard, allowing GIGABYTE or the customer to select their own HW or SW RAID card that is most suitable for their individual requirements". Head on over to the linked official product page to discover more about the S451-Z30 specs, diagrams, options, and use cases. For purchasing information contact Gigabyte via its business-to-business portal b2b.gigabyte.com. I really like the new Gugabyte Chassis'. These are great configs, especially the Storage server! Processor has some security in it, but is the chipset secure? If not who cares? Not saying it isn't, just asking. I haven't read to much on AMD server situation in a while until they start selling a bunch that will affect the stock price. Until then, bleh, as for me it's about making money on it and they're not quite in the game yet IMHO. Ground-work is all that is being done so far it seems and figures as biz people need long leads for verification/testing etc. IE, Cuda wasn't built in a day. It was ~7yrs before it pretty much took over app world for the stuff it's used in. I expect things to really pick up next year (for AMD's bottom line that is, IF and ONLY IF, they price HIGHER for that win) as it will be 7nm vs. Intel 14nm. That's a reason to make a purchase if you've been testing the crap out of gen1 and everything is working right. AMD should have a year of that everywhere next year as Intel is way late with 10nm (might miss xmas 2019 for mass systems? WOW). I'm thinking a Q1 replacement of my just purchased 8700k (and it will likely be AMD, since Intel will still be 14nm and have security issues still. AMD will be a no-brainer for me in Q1 as I won't wait for a lower power 8core with hyperthreading until xmas or later (intel's 8 looks to drop this, so I'm out at 95w…LOL). AMD will win by default just for being way early this time it seems during intel problems at the fabs. Processor has some security in it, but is the chipset secure? If not who cares? There have been issues found with the security processor in the past, but that feature is mainly aimed at things like encrypted virtual machines and none of these boxes seem to be really aimed at the VM market. People hit by Meltdown performance impacts might care. That is mainly a Linux issue, and Linux is really big in servers specially HPC stuff that these seem to be aimed at. HPC users aren't so bothered at long validation cycles either, they just want performance and will work around issues.